On Day 3, I listed some of the recordings I did for Books On Tape which have been deleted from their catalogue. 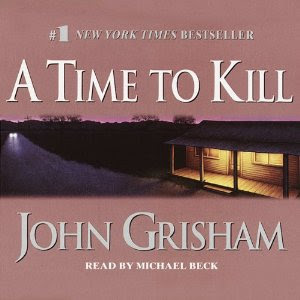 Among them was A Time to Kill, John Grisham's first (and many think his best) novel, written when he was struggling to make his mark as a novelist. It's an excellent story of race and justice in the vein of Harper Lee and William Styron, original and beautifully crafted. I thought this recording was long gone, but I see now that it has been re-issued for download and is available on Audible, along with the abridged recording by Michael Beck. 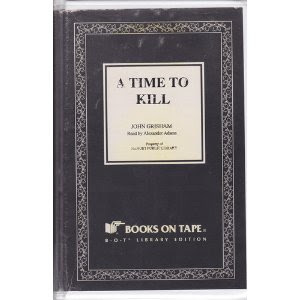 The unabridged version includes an interesting introduction by Grisham, detailing the genesis of the book and how it came to be published. Initially released in a tiny print run, it was re-published to critical acclaim following the success of his blockbusters The Firm and The Pelican Brief. Popular as these books have been, many wondered what happened to the wonderful writer who lurks behind the breathless, improbable cliff-hangers he began churning out. If you haven't read this, it's high time to do yourself a favor. It's a terrific book, a legal thriller with substance, style and heart that hasn't dated a bit. Apparently no one could be bothered to make a cover with "Alexander Adams" on it. No matter; below is a picture of the old library edition I found on Amazon.